Robert Fowler (1853-1926) was a Scottish artist who painted mythological scenes and landscapes. Fowler was born in Anstruther, Fife, and was brought up mainly by his uncle and aunt while his parents were away on business. He showed a very early aptitude for art, starting first with pencil drawings then moving on to painting and clay modelling. His family moved to Liverpool and Fowler went to school at Liverpool College. 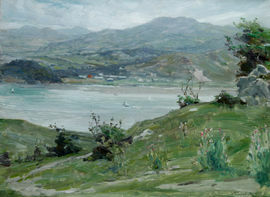 At the age of 16, he found employment in a commercial office where his talent for art was recognised by his employer, who encouraged Fowler's parents to send him to art school. Fowler went to London to study at the Heatherley School of Fine Art and the South Kensington Schools. He also spent much time making drawings of the exhibits in the British Museum, being particularly impressed by the Elgin Marbles, and found inspiration in the local art galleries. 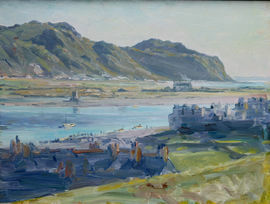 However, his art studies were curtailed by health problems which necessitated a long period of "convalescence" in Yorkshire and Llandudno in Wales. He moved back to Liverpool and took an art studio in Castle Street, which became his base for several decades. 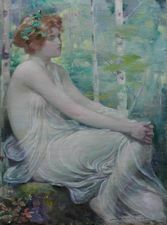 He exhibited his work at the Liverpool autumn exhibitions in 1875, and at the Royal Academy, London, in 1876. He designed posters for the Walker Gallery, and also had work exhibited abroad in Paris and Munich. His studio became a magnet for other artists, writers and musicians. He moved to London in the early 1900s and had a studio in Tite street, Chelsea for some years. Fowler became a member of the Royal Institute of Painters in Water Colours (RI) in 1891, and the Royal Society of Painters in Water Colours. His style was classical - frequently drawing on mythological themes - but also with strong elements of symbolism and Japonism. Artists who influenced Fowler included Frederic Leighton, Albert Moore, George Watts, James Whistler, Frederick Walker and David Woodlock (1842–1929).